At the start of this month I blogged about the quality of teachers we want in England, concluding that it depends on the evidence. So I’m now involved with a project that will help define the type of initial teacher training needed for the English chemistry teachers of the future. This is part of that wider evidence gathering process. It would be great if other subjects were doing the same. In history, which is the humanities subject I studied at university, traditionally a significant percentage of graduates go on to teaching – a recent study by Oxford University of 11,000 humanities graduates between 1960 and 1989 indicates that as many as quarter of them joined the teaching profession at some stage in their careers. We need more up-to-date information about the knowledge and skills profiles of such entrants now. Another subject is computer science, which has recently been included as a core subject within the school curriculum and school accountability measures. 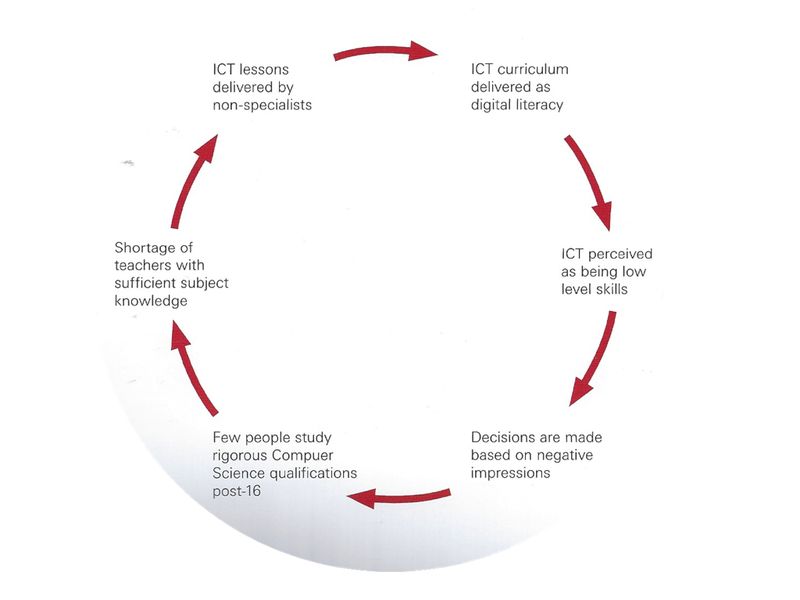 When I was at the Royal Society we produced a report on what was then called ‘computing’ – below is one diagram from our report showing the ‘vicious’ cycle of ICT teaching in England which we maintained had a negative impact on school computer science qualifications, so trainee teachers lacked the required subject knowledge. Shut down or restart? The way forward for computing in UK schools. The Royal Society, 2012. I’m sure there are other cases in other subjects (and in other countries) where more evidence is needed. Please give me your suggestions in the comments below.